Throughout history, humanity has sought to explain the unexplainable through spirituality and science, grappling to glean truth from competing ideologies. In a complicated and conflicted world, it would help to at least be assured in our faith, comfortable in the knowledge that we can follow the spiritual blueprint espoused by our favorite entertainer. These responses to the question "Is there a God?" don't form a cohesive answer, so readers will have to draw their own conclusions. 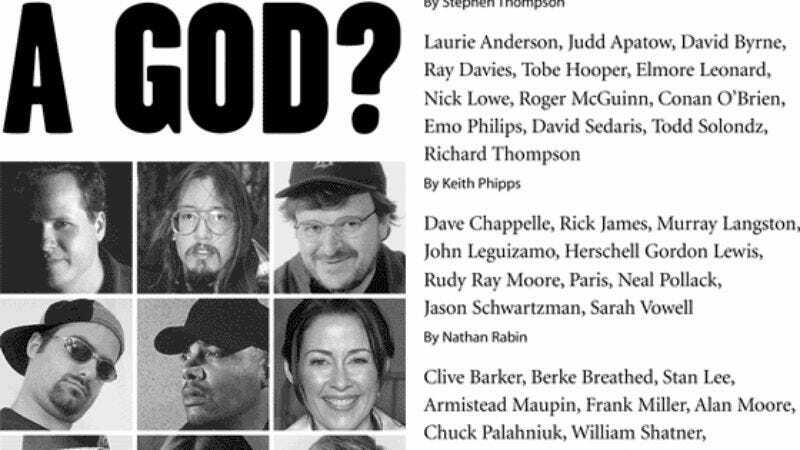 For example, those with unwavering faith in a higher power can take solace in the beliefs of Rick James and Everybody Loves Raymond star Patricia Heaton, while atheists can share a common bond with director Todd Solondz and Buffy The Vampire Slayer creator Joss Whedon. Those who remain undecided should scour the 40 remaining answers—gathered over the course of the past two years—and base their religious beliefs on those of the celebrity they like best. David Byrne: Um… whoa. I'm going to resist trying to go for a flip and funny answer. [Pauses.] I would say yes, but in a form so strange and so convoluted and so unusual for us that we will never, ever comprehend it. MB: Absolutely, absolutely. That's why we suffer so. Stan Lee: Well, let me put it this way… [Pauses.] No, I'm not going to try to be clever. I really don't know. I just don't know. Steven Wright: Ahhh… You'll have to ask Jesus. Alan Moore: [Laughs.] Well, I can't move for them, quite frankly. I'm looking at about 12 of them from where I'm sitting at the moment. I'm kind of swamped for choice. Yeah, there's probably tons of them. There's probably a swarm of gods. I've had sort of passing acquaintanceship with a few of them. Whether there's one definitive one… Yeah, there probably is. But how the celestial-league table stacks up, I'm not sure. DS: I think that He exists. I don't know that there's just one God who pays attention to some people but not to others. But I think that if you want God to exist, and if you tell yourself that He does, then He does. I don't think of God as a person with sideburns or anything—I think I just think of Him as an idea. So if you want that idea to exist, then it does. Chris Matthews: Yes. In 1978, I was in a plane situation, flying in a plane without air pressure. I'd never been in a situation where the air was disappearing from the cabin, where you had to put the mask on, and I was scared to death. I didn't know whether I could get air, and I remember putting on the oxygen mask—scared to death that it wouldn't work—and at that moment, I imagined God. He was a guy with a beard, Jewish probably, although not overly ethnic, from 2,000 years ago. I imagine Jesus as God. That's my only response to that question. Bill Maher: I think there is. We did a show last night about God and religion with Dave Foley, who I love, and we were arguing against this one woman who had a book called I Like Being Catholic. Someone said, "Oh, boy, a lot of atheists on this panel." I said, "I'm not an atheist. There's a really big difference between an atheist and someone who just doesn't believe in religion. Religion to me is a bureaucracy between man and God that I don't need. But I'm not an atheist, no." I believe there's some force. If you want to call it God… I don't believe God is a single parent who writes books. I think that the people who think God wrote a book called The Bible are just childish. Religion is so childish. What they're fighting about in the Middle East, it's so childish. These myths, these silly little stories that they believe in fundamentally, that they take over this little space in Jerusalem where one guy flew up to heaven—no, no, this guy performed a sacrifice here a thousand million years ago. It's like, "Who cares? What does that have to do with spirituality, where you're really trying to get, as a human being and as a soul moving in the universe?" But I do believe in a God, yes. Berke Breathed: Well, I bloody well hope so. Like Ricky Ricardo used to yell, "Luuuucy… You got some 'splainin' to dooooooo." I'd start with Hitler surviving the childhood flu in 1902. I'd end with mosquitoes and rap music. What's the plan, fer Chrissake? No offense.